A funny, touching, entertaining Glee episode that didn't feature a single line from Sue Sylvester?!? I never thought I'd see the day. But that's exactly what transpired on "Silly Love Songs," as the show stopped feeling like a Public Service Announcement for a week and actually focused on well-paced, well-written relationship developments among its core characters. It's no secret that I wasn't a fan of Sunday's post-Super Bowl episode and I can explain why: on that installment, it felt as though the storylines were constructed after the musical numbers. It's clear the show wanted to base everything around the Thriller mash-up at halftime and worked out from there. Storytelling suffered as a result (little build-up to the Quinn/Finn kiss, Karofsky somehow being embraced by Will simply because he was good at singing). Compare that to "Silly Love Songs." 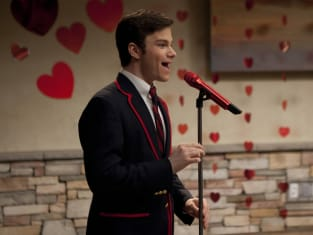 We spent a great deal of time with characters this week, actually delving into the Kurt/Blaine dynamic, for example, instead of just watching Kurt ogle his crush during a Blaine solo (seriously, does any other Warbler sing?!?). It was refreshing to get to know Blaine a lot better, especially considering Glee addressed how he's seemed a bit too perfect this whole time. Turns out, he's as confused as most high school students. He just hides it behind his confident singing ability. I never felt preached to at any point, despite the fact that Kurt and Rachel both passed along an important message about not relying on someone else for your self-worth. But the message was organic, it flowed from their recent experiences, not from a contrived musical number or sudden development. Also, Lauren was hilarious. I'm fully on board Team Luck. And what a nice showcase for Santana. She was humanized while also keeping her edge... and looking incredible in a candy striper outfit. A great Glee episode overall. The music was reflective of various individuals' struggles and triumphs, which ought to be the goal every week. I'll say it again: characters need to come first. Now, let's reincorporate Sue, sprinkle some sarcastic one-liners into the mix and finish season two strong!